Author: Cornelia Bock. Series edited by: Wilhelm J.G. Möhlig. 12 pp. Roman, 162 pp. Even after his 450th birthday, William Shakespeare is still well-known and cherished around the world. His opuses are read and staged in many coun­tries and in different languages. New editions of his dramas and sonnets ap­pear regularly both in the original language English and in other languages – indeed Shakespeare is the most often translated author worldwide. The topics he deals with in his works are considered as universal, and he is not only regarded as an English or European writer. The historical plays stimulate reflection over one's own history. Particularly the tragedy Julius Caesar is a strongly political drama, and its guiding theme of regicide and hope for a new political system can easily be translated to another time and place. Translations of literary works are of vital importance because they offer the opportunity to be­come acquainted with authors, stories, cultures, ideas and values of societies other than one's own even without mastering the language in question. Furthermore, translations make sure that the original opus sur­vives and overcomes temporal as well as spatial distances. A language itself may actually grow or develop through translations, as in many cases where the simple borrowing of connotations, allusions and references from the original language is not feasible, adequate substitutes have to be found in the target language. Realia and proper names are crucial elements of literary works due to the fact that they characterise places and figures and embed the story into a certain society with socio-cultural values. These two aspects are interesting and revealing for both translation science and the study of literature as well as for onomatology, since the analysis of their treatment in translations is suggestive of the general modus operandi of translators and of the norms and conventions of translation in a given linguistic community. It is these processes and features that the present book is intended to shed light on as well. Taking the ex­amples of Shakespeare's Julius Caesar and Macbeth, the initial question is how individual translators deal with proper names and titles or forms of address, i.e. which strategies they adopt to translate these items from the source text into the target text. Of further interest is the question if there are differences with regard to the treatment of personal and place names as well as proper names as allusions, and if and how this might be distinct from the treatment of titles and forms of address. This array of questions is first exam­ined on the basis of translations into African languages which build the focus of this study. Subsequently, translations into European languages are analysed in order to conclusively answer the question if the hand­ling of proper names and titles in translations into African languages differs from that of translations into European languages, what makes up this possible difference and what are the reasons for it. 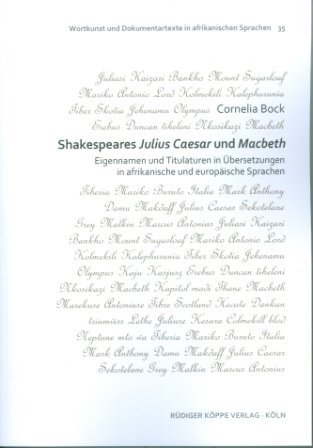 The author proceeds on the assumption that the translations into African languages exhibit greater deviations from the original English text which most notably occur with proper names as allusions and with titles, since the former require specific knowledge on the readers' part and the latter are cultural concepts – the reason for this difference being the greater linguistic, spatial and particularly cultural distance between Shakespeare and the translators and readers of African languages.